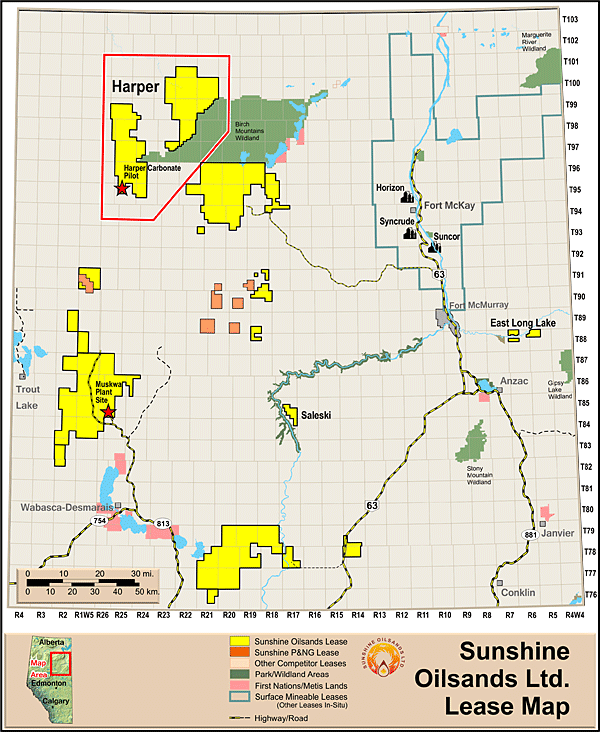 Sunshine's Harper carbonate pilot project location provided geological and reservoir characterization that is the underpinning for Sunshine's 600,000 bbl/d production forecast development plan. 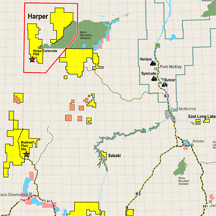 The Harper asset represents over 10 billion barrels of petroleum initially in place of carbonate resource. Sunshine's holdings in the Harper region represent a significant land base and contains several prospective horizons. The Harper Carbonate pilot in the final stages of drilling and pilot facility construction for the extended pilot activities. The Harper area is located 12 miles north of Shell Canada's significant oil sands leases in Townships 95 to 98, Ranges 23 to 25. Sunshine applied to the ERCB and Alberta Environment to conduct a pilot extraction scheme in the Grosmont carbonate reservoir in October 2008. The pilot project was approved by the ERCB on November 27, 2009. In Q1 2011, we mobilized equipment to the pilot site and demonstrated reservoir response to thermal stimulation. Sunshine applied for a pilot project extension to continue the demonstration of reservoir response to thermal stimulation. This pilot application extension was approved on October 28, 2011 and we mobilized equipment to complete Cyclic Steam Stimulation (CSS) cycles in Q1 2012. The Harper asset represents a significant land base and contains several prospective horizons. The greatest impediment to carbonate development historically is believed to be the geographic remoteness. There is no carbonate bitumen development in the eastern side of the Athabasca oilsands area and the western part of the Athabasca oilsands area has been more difficult and expensive to access until recently. The reservoir has some unique characteristics and delivering economic production is based on understanding the geology and the techniques to produce efficiently. Sunshine continues to assess and develop technology to understand and characterize the reservoir.